Phil Mac’s Be There Too features on the fantastic new compilation by Dr. Cat. 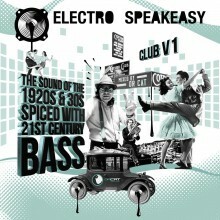 Electro Speakeasy Club V1 departs from the classic Electro Swing genre. It’s a heaving, glorious house, breaks, electro and techno affair spiced with 20s flair, vintage blues and 21st century bass.